We are offering Patient Education Tracheotomy Set Training to our clients in order to meet their different requirements. Sourced from the leading manufacturers, we are offering this product at reasonable price range. It is ideal for educating the patients as well as caregivers the skills needed to perform at home. Health care professionals are elated with this simulator’s realism, durability, and texture. 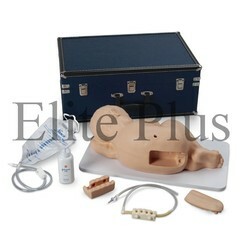 Makes teaching easy, the Breast Self-Examination Simulator Training may be used in either the vertical or reclining position. Practice and demonstrate standard Upper Stump Bandaging Simulator Training procedures. Can be used to demonstrate the attachment of prosthetic devices. 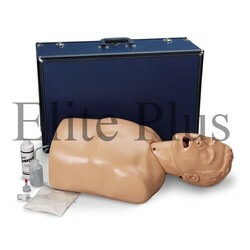 26" x 18" x 13"
Our firm is providing NG Tube & Trach Skills Simulator Training in order to meet the requirements medical students. It is sourced from leading manufacturers and highly demanded in the medical colleges and training centers. 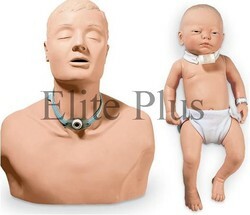 By our vendors it is developed in order to aid with the training, instruction as well as practice of important tracheotomy care and skills for the patients of respiratory conditions. 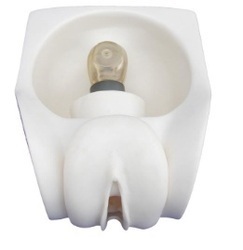 It is also designed for the instruction of gastrointestinal care procedures through oral as well as nasal access. This simulator allows the practice of cuff inflation and dressing changes. Infants commonly require lumbar puncture as a diagnostic procedure used to collect a sample of cerebrospinal fluid (CSF), measure cerebrospinal fluid pressure, or to inject medications intrathecally. The life/form® Pediatric Lumbar Puncture Simulator Training represents a 10-12 month old infant placed in a left lateral decubitus position with the neck and knees flexed, approximating the necessary fetal position. The embedded iliac crest offers exceptional realism, while the removable spine, spinal canal and skin pad make training simple and hassle free. Lumbar puncture may be performed in the L3-L4, L4-L5, or L5-S1 spaces. The correct site can be located by palpating the iliac crest and spine. A small “give” will be felt as the spinal needle is advanced slowly into the proper space. Fluid will flow when the needle is in proper position. Students will appreciate the opportunity to practice this delicate but commonly performed procedure on a simulator that is both appealing and anatomically accurate. The life/form® Intraosseous Infusion Simulator Training is a dramatic and exciting training aid designed to demonstrate and simulate the intraosseous infusion procedure. Students will be able to learn and practice, with incredible accuracy and realism, a procedure which has been difficult to simulate in the past. Prior to the Intraosseous Infusion Simulator, educators resorted to unsanitary chicken and turkey bones. PALS programs will find this teaching aid a convenient and sanitary alternative. You will appreciate the convenience of having the life/form® Enema Administration Simulator Training to teach enema procedures. Use it for group demonstrations and practice sessions of any size. 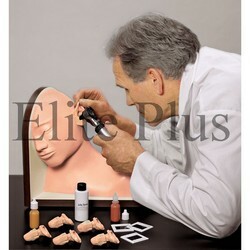 Each student can realistically practice administering an enema using this lifelike model. An inexpensive kit that offers practicing Suture Kit - White Training at all levels. 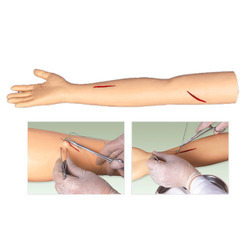 Suitable for students who need to learn or health care professionals who want to perfect the different types and techniques of sutures and other skills needed for wound closure. The instructor or student will have the ability to make incisions and determine the depth of suturing and the technique to be used. Practice and demonstrate tying knots, stapling and placement of staples, use of surgical glue, suturing deep tissue (placement and closure), and suturing subcutaneous tissue (placement and closure). 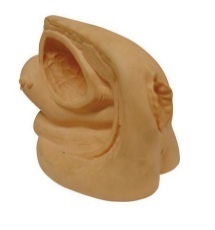 14-1/2" x 9-1/2" x 3-1/2"
Product Name: Advanced Male Internal & External Genital OrgansProduct No: XC-331CMaterial: PVCDescription:Used to practice the insertion of a lubricated catheter through a collapsible external urethra meatus into the bladder with this realistic model. Owing to our immense expertize in this domain, we have been able to bring forth an exclusive range of Advanced Surgical Suture Arm Models. This product is sourced from the leading manufacturers so that we can fulfill the varying demands of our clients all over the globe. Offered product is demanded in the medical training institutes. 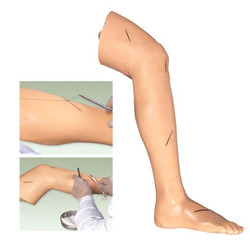 Carving a special niche for ourselves in the market, we are involved in importing, supplying and exporting of a wide range of Advanced Surgical Suture Leg Models. We sourced it from our well-established vendors so as to ensure its quality and authenticity. Owing to these features, it is highly demanded in the medical institutes. We are providing this product to the clients at reasonable price range. Life-size full-color prints on film, embedded at the tympanic membrane, provide the same realistic views experienced with a live patient. 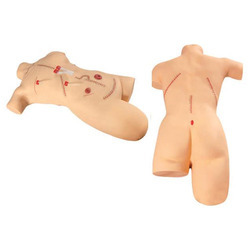 Being a quality-centric firm, we are involved in importing, supplying and exporting of a wide range of Female Catheterization Training Simulator Models. Quality is our prime goal and maintain it in our product. Therefore, it is procured from the leading vendors of the market. Owing to their precision and durability, these products are highly demanded by our esteemed clients. Moreover, our clients can avail all these products at reasonable prices with assurance of timely delivery at their premises. Practice and demonstrate standard bandaging procedures. The Lower Stump Bandaging Simulator Training is long enough to allow carrying the bandage around the body over the uninvolved hip at the level of the iliac crest. 35" x 15" x 10"
21" x 21" x 11"
This model allows students to locate the urethra and pass a lubricated catheter through it into the bladder. Features:Stucture of left gluteal : osteal marks, glutealmuscules, ischiadic nerve and veins.Left gluteal can be taken off. So it is easy toobserve internal structure and make sureposition of ischiadic nerve and veins.Gluteal intramuscular injection training.